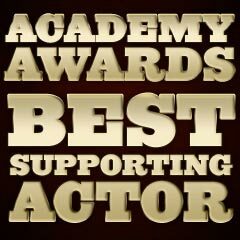 The Best Supporting Actor award should actually be titled "the best performance by an actor in a supporting role." In 1936, the acting awards were expanded to start recognizing supporting roles. Best Supporting Actor Oscars are traditionally given to actors who stand out in small roles. It is quite common that the Best Supporting Actor winner is either an older, established performer, or a young, inexperienced actor. Throughout Academy history, most of the winners in this category usually have no previous Oscar wins. Within five years, Walter Brennan won three Best Supporting Actor awards. He was the first and - to date - is the only performer to win three supporting awards (and within the shortest period of time - five years! And his three wins were in the category's first five years). Therefore, he was also the first to win three acting Oscars and the first Best Supporting Actor Oscar recipient. Seven other actors have received two Best Supporting Actor awards (among them is one performer who has won a consecutive statuette, Jason Robards). Four actors have received four Best Supporting Actor nominations, although only two of them won subsequent awards. The two actors with the most Best Supporting Actor nominations (with no wins) include Arthur Kennedy and Claude Rains. No Best Supporting Actress has won two Academy Awards in a row. Jack Lemmon, Best Supporting Actor (Mister Roberts (1955)), Best Actor (Save the Tiger (1973)) - the first! Victor McLaglen was the first performer to be nominated for a Best Supporting Oscar (for The Quiet Man (1952)) after having already won the Lead Performance Oscar for The Informer (1935). The only actor to win a posthumous acting Oscar in a supporting role was Australian actor Heath Ledger for his role as The Joker in The Dark Knight (2008). He was the second actor to win a posthumous acting Oscar - the first was Peter Finch, who won Best Actor for his role as Howard Beale in Network (1976). No single performer has ever won two performing awards in the same year. There have been a total of eleven performers who are double nominees - that means that they have received two acting nominations in the same year. Three were actors and eight were actresses (wins are marked with *). (See the Best Supporting Actress section for eight actresses who have duplicated the feat.) Of the 11 performers (actors and actresses) who've been recognized with nods for two performances in the same year, seven of them ended up winning one of the trophies. Double nominees usually win in one category (i.e., double nominees Al Pacino and Jamie Foxx won as Best Actor, and Fitzgerald won as Best Supporting Actor - see below). Russell received an additional Special Honorary Oscar for the same performance "for bringing hope and courage to fellow veterans"
George C. Scott in his third screen appearance in The Hustler (1961) received his second supporting nomination in 1962 - after his first nomination received in 1960 for Anatomy of a Murder (1959). (His first film was The Hanging Tree (1959).) He became the first actor to decline his Oscar nomination - in protest of fellow actors' practice of campaigning for awards, calling the awards demeaning and self-serving. When Scott received another Oscar nomination (and won) as Best Actor for Patton (1970), he declined to accept the nomination and the award, because he did not feel himself to be in any competition with other actors, calling it a "meat parade." Jamie Foxx also set a record for being the first black to debut as a nominee in two categories in the same year, lead and supporting, for Ray (2004) and Collateral (2004). Morgan Freeman's Best Supporting Actor win for Million Dollar Baby (2004), paired with Foxx's Best Actor win for Ray (2004), was the first time that African-American actors won in their respective categories in the same year. Gig Young (with real-name Byron Barr) was the only Oscar winner, Best Supporting Actor for They Shoot Horses, Don't They? (1969), who adopted his screen name from the role he played in The Gay Sisters (1942) as "Gig Young". 1948's Oscar-winning director John Huston directed both his father (Walter Huston) to a Best Supporting Actor Oscar and his daughter (Anjelica) to a Best Supporting Actress Oscar in respectively, The Treasure of the Sierra Madre (1948) and Prizzi's Honor (1985) 37 years later. [Huston won two Oscars for writing and directing the 1948 film.] This remarkable feat made the Hustons the first family with three generations of Oscar winners - Huston became the only director to have directed both his father and daughter to Oscar victories. Since Huston also received an acting nomination (supporting) for The Cardinal (1963), the Hustons are the only grandfather-father-daughter acting nominees in Oscar history.